Posted on 2, August 2016 by EuropaWire PR Editors | This entry was posted in Aviation & Aerospace, Defence, Luxembourg, Netherlands, Security & Safety and tagged A330 MRTT aircraft, Airbus A330 Multi Role Tanker Transport, The Netherlands Ministry of Defence. Bookmark the permalink. LUXEMBOURG, 02-Aug-2016 — /EuropaWire/ — The Netherlands Ministry of Defence has today notified Parliament of the signing of a Memorandum of Understanding with Luxembourg to proceed with the acquisition of a pooled fleet of Airbus A330 Multi Role Tanker Transport (A330 MRTT) aircraft, and the signing of a contract paving the way for the delivery of two aircraft with options for up to six more when, as expected, other nations join the grouping. The contract also covers two years of initial support. Further details can be seen here. We strongly welcome this agreement to acquire aircraft for operation by NATO following a process facilitated by the European Defence Agency. Final arrangements will be made in the coming weeks between Europe’s organization for the management of cooperative armament programmes – OCCAR – acting on behalf of the NATO Support & Procurement Agency (NSPA) and the nations, and Airbus Defence and Space for the completion of the financial process resulting in a formal order for the aircraft. Discussions are underway at various stages with Belgium, Germany, Norway and Poland with a view to those nations also participating in the programme, known as the Multinational MRTT Fleet (MMF) initiative. 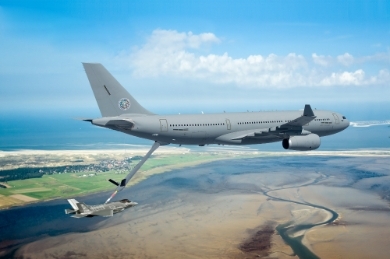 Video and imagery of the A330 MRTT can be downloaded here.